Couples that decide to get married at Lake Como – or in Italian Lago di Como – will be overwhelmed by its fascinating scenery! High mountains, cypresses, palms as well as beautiful locations for a wedding reception are the perfect frame for unforgettable weddings at Lake Como in Northern Italy. 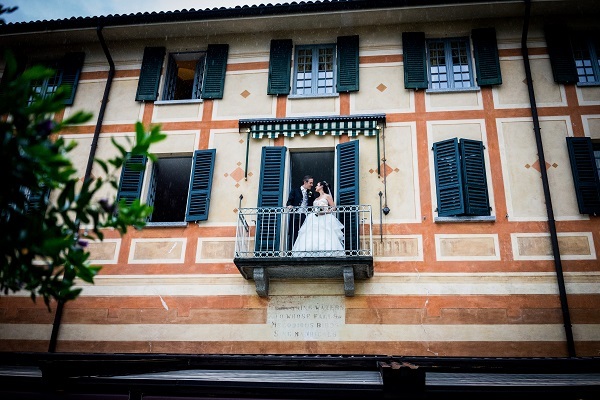 As unforgettable venues for a wedding Lake Como offers picturesque villas like Villa Carlotta or Villa Balbaniello, hotels and farm houses as well as antique rustic restaurants. For civil or religious wedding ceremonies Lake Como in Northern Italy is the perfect decision for a destination wedding. A wedding at Lake Como can also be perfectly combined with a honeymoon which can be enjoyed in this beautiful region right after the wedding. Along the waterside you will find many small romantic villages and towns whose charm reminds of previous times. Already the Romans have been impressed by the beauty of Lake Como and were settling around the mountain lake’s waterside. While the snow covers the top of the mountains, there is a mild Mediterranean climate around Lake Como. Subtropical plants, endless olive groves and palms extend on the lake’s promenades like the picturesque promenade in Bellagio. Also lots of celebrities have chosen Lake Como as their holiday residence so that it is quite possible that you will meet George Clooney, Madonna or Brad Pitt during your wedding at Lake Como! Getting married at Lake Como offers the possibility of celebrating the most beautiful day of your life at one of the most beautiful lakes of the world! Moreover, the lake is – thanks to its matchless scenery and various landscapes – often used as scenery for famous Hollywood films! Lake Como offers a huge variety of beautiful venues for individual protestant, catholic, symbolic or civil weddings – be it with a lot of glamour or rustic details, in a fairytale castle, in a villa or on a beautiful vineyard. Thanks to our wide portfolio of beautiful wedding venues on Lake Como, there is the perfect wedding venue for every couple! The locals are very friendly and helpful. They will pamper the bridal couple as well as their guests with culinary delicacies and turn the wedding into an unforgettable stay full of hospitality and cordiality! The beautiful towns around Lake Como, like for example Como or Belaggio, offer various possibilities for elopements. All the romantic villas, antique registry offices and Italian gardens build the perfect frame for a wedding at Lake Como.